When we think of Buick, we think of the classic American station wagon that our parents had when we were kids. We have fond memories of family road trips, fighting for the window seats with our siblings, while our parents tried to keep their cool long enough to get to the next rest stop. However, what we don’t typically think about is luxury. But it looks like Buick is hoping to change that with the 2018 Buick Regal TourX. The TourX isn’t the massive wagon we all remember. This car is sleek, polished and a genuine joy to drive. So, if your first instinct was to write the car off based on word association alone, you might want to think again – especially if you are the type who likes to drive a car that will be a bit of an anomaly on the street. Buick recently teamed up with Travel Oregon to give select media a look at this updated wagon through the Oregon lifestyle. Considering Buick is marketing the TourX to adventure types, hosting the media drive in Oregon makes perfect sense, with its abundance of beautiful cycling routes, hiking trails and kayaking spots. That means that we enjoyed scenic drives along the famous Oregon coast, a private tour of the Eugene-based Ninkasi Brewing Company, a kombucha tasting at Townshend’s Eugene Teahouse, hiking through Silver Falls State Park, cycling through the countryside and of course, Goat Yoga with the founder herself, Lainey Morse. Driving from Portland to Newport and then all the way to Eugene gave us plenty of time to get to know the TourX. Our first impression of the car was positive, albeit tentative. The clean, straight lines of the exterior boast some great design accents that caught our eye, such as the sleek silver line that runs from the wing mirrors, up to the top of the windows and down to hook around the rear tail lights. The shape is brought into the LED signature headlights as well, which feature an arrival sequence that lights your way when you approach and exit the car. However, we aren’t a fan of the black plastic that spreads across the bumpers, over the wheel arches and along the bottom sides, as it definitely hints at the car’s affordable price tag. Buick offers integrated aluminum roof rails and accessory cargo bars that the dealer can install for you, making it easy to attach bicycles and adventure gear. While we didn’t try this out for ourselves, we heard from journalists who did that it was a breeze. The car also features a hands-free power liftgate that is indicated by an LED projection of the Buick symbol on the ground in the place to wave your foot, coming in handy for when your arms are full. 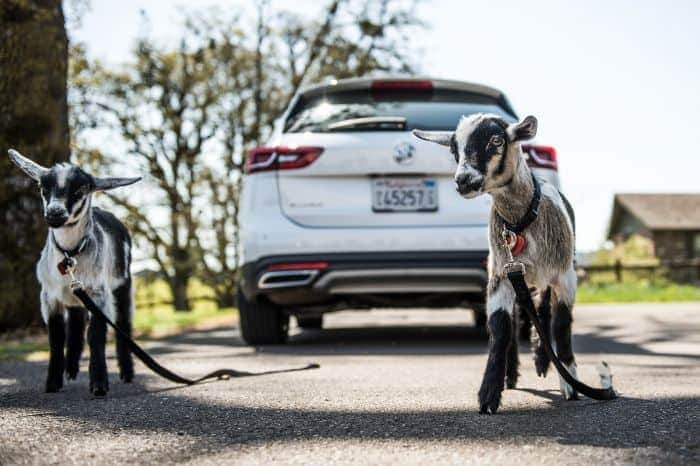 Additionally, you can opt for the 40/20/40 split rear seating configuration, so that you can easily accommodate large cargo items – or maybe you might want to pop some baby goats in the back for an adorable photo op. By the way, if you haven’t tried goat yoga, we cannot recommend it enough. You might think you have perfected planking, but wait until an adult goat unexpectedly jumps onto your back and then see how well you keep your body in line. But we digress. The standard TourX has a 2.0-liter turbocharged I-4 with 250 horsepower, 295 lb-ft of torque and all-wheel drive. While it certainly isn’t going to launch you ahead of the pack like a Lamborghini, it has much more kick than we were expecting and it was more than enough to zoom by slow drivers on our way to Silver Falls State Park. In fact, after driving this car for more than 400 miles, we can confidently say that it is without a doubt, the perfect touring vehicle. Both comfortable and quiet, the TourX incredibly easy to drive. With agile steering, responsive breaks and the ability to hug the road even on the windiest of Oregon trails, we were pleasantly surprised by the TourX. That said, the price tag is certainly visible in many of the design choices for the interior, such as the use of plastic. We really only take issue with one design choice though and that is of the infotainment system. Small in size, the screen would definitely look better if space had been utilized more efficiently. However, when the budget is tight, you do what you can. Though it’s small, the infotainment system actually lets you utilize features like navigation while the car is in motion as long as you promise you are the passenger. This might not be the safest, since the locking system is meant to keep drivers from being distracted, but we have to admit that it was nice being able to pop in an address at a stop light without a problem. And once we switched over to the passenger seat, it was nice being able to navigate through the system without being continually locked out. It’s a small thing, but it makes a huge difference. With a price tag that maxes out under $50k, the Buick Regal TourX isn’t exactly what we think of when we think of luxury. However, luxury ultimately means having the freedom to do and buy whatever you want. We wouldn’t be the first ones to tell you that a billionaire with a Buick on one side of their garage and an Aston Martin on the other side wouldn’t cause anyone to bat an eye. When it comes to having money, we like having options. Sometimes all you want is a reliable touring automobile that won’t give you any problems, is comfortable and smooth to drive, and won’t make you shed a tear when someone scratches it in the grocery store parking lot. Plus, we kind of like the idea of jumping into the Buick wagon before word really gets out that the marquee is changing it up.